RUSH: Well, things keep happening here before I get to my questions for Hillary and Obama. I was just advised that CNN just recently fact-checked me in some assertions I made about the attorney general, William Barr. This was just moments ago, John King on CNN. KING: It also, though, has raised the expectations — this could be a trap down the road for the attorney general — of the president’s allies. 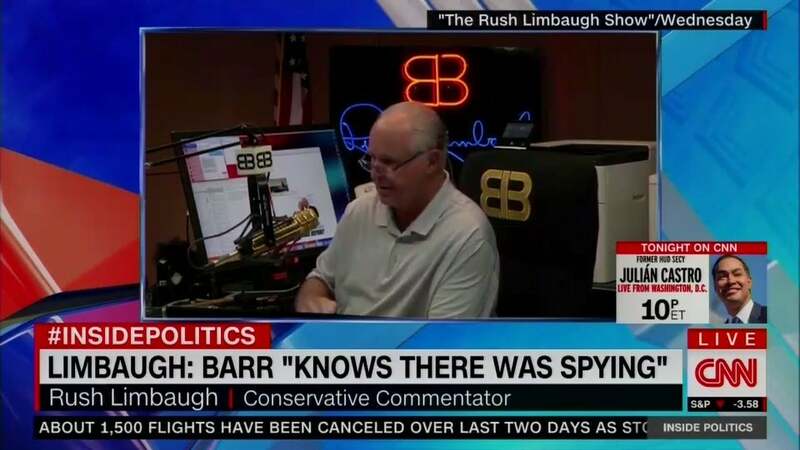 Listen to Rush Limbaugh saying: He said spying. Amen! RUSH ARCHIVE: He knows there was spying. He knows who the spies were. He knows the informants that were implanted into the Trump campaign. We finally got the guy who is gonna dig into this. He understands exactly what happened here, as we all do. This is just the first time it has been officially explained. COLLINS: — just to make that clear for anyone who wasn’t watching the testimony yesterday. 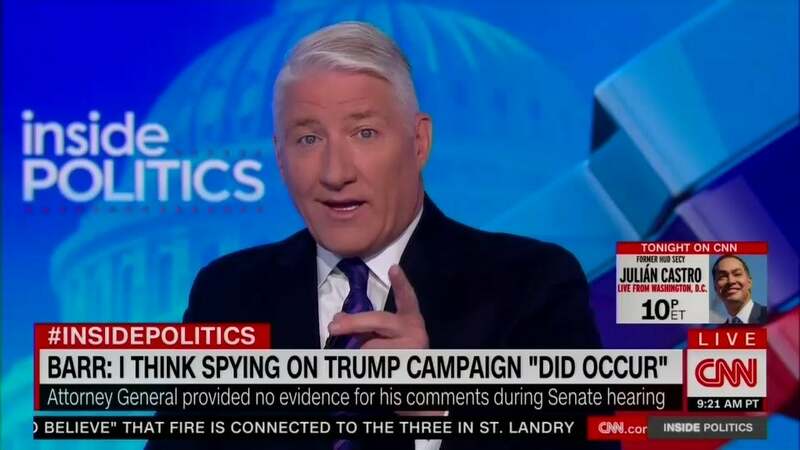 But when he was asked, does he have evidence that spying occurred… ‘Cause he said, “I do think spying did occur.” He said he didn’t have any evidence he could cite right now. So he’s going to look into this, and then he later backpedaled some, saying he just wanted to make sure there was no improper surveillance. He wasn’t launching an investigation of the entire FBI. No. We never said he was. We’re talking about the FBI leadership. It’s about eight or nine people there. Not the whole FBI. That’s one of the problems of what these people did! They besmirched and impugned the entire FBI with this. RUSH: I got a note from somebody about the sound bite we played moments ago with CNN fact-checking me. I think that’s probably relevant. I think it’s probably a good observation. Look, these people, you could see it on their faces yesterday. I tried to make the point in the last hour yesterday, you could see — it’s hard to describe. For two years these people were arrogantly confident that they were gonna get Trump. It might take ’em a year, two years, four years, but they were gonna do it. If you put this in a football game connotation, that’s one of the biggest fumbles in the history of the game. That fumble was recovered by us. We have immediately gone on offense, our side has. They have been on offense. They’ve had the ball. They’ve been the New England Patriots for two years and counting. And yesterday they lost the ball. And you could just see it on their faces. And they spent the rest of the day yesterday trying to assure themselves and everybody else, their viewers, that everything was gonna be okay. But it was unmistakable. They knew that the jig was up and it was gonna be time to circle the wagons and try to salvage something. I mean, losing the narrative in a matter of seconds is what it was. Now I think anybody that’s attempting, like I was yesterday and today, to properly characterize what this upcoming investigation and what it could potentially reveal and lead to, criminal prosecutions, criminal convictions, these people know. 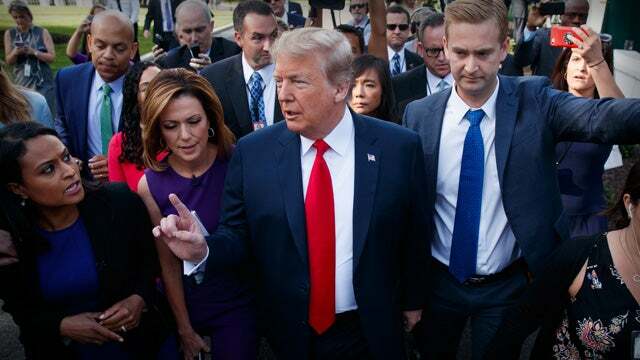 Now, the media is not gonna be charged with anything, but they were in on it. They were complicit. It’s the kind of thing that in the past they would have exposed! And if this had been a Republican-run operation, they would have exposed it. But they were complicit in this because they are no longer, never have been, objective. But you could just see, they knew they were gonna lose the game. And for two years they’d already thought they had won it. And so now they’re doing everything they can to make sure their audiences continue to have some kind of fake news to digest. But I’ve been calling female infobabes “infobabes” for 25 years, maybe even longer. I mean, Joe Biden’s been touching people for 25, try 50 years. Biden’s been… By the way, I now pose… I had a golf weekend, and a woman (not an infobabe, a woman) wanted a photo with me. So I took a photo standing beside her, and people are snapping away at their phones. Ching! Ching! Ching! I said, “Okay, one more, one more.” I stood behind her, I put my hands on her shoulders, and I put my head right next to her.